Washington Square Press, 9780671034986, 192pp. Having children transforms us -- through the amazing power of our love for them and theirs for us, through the anger they can provoke, and because being good parents means we must accept that we are no longer children. In As Good as I Could Be, bestselling author Susan Cheever chronicles with passion and courage her own imperfect transformation, offering inspiration for other parents doing the best they can. By relating the trials and triumphs of raising a daughter and a son Cheever illuminates some basic truths learned along the way: a family should not be a democracy; teaching your children to celebrate their mistakes helps them forgive yours; and a damaged childhood is not a guarantor of bad parenting. 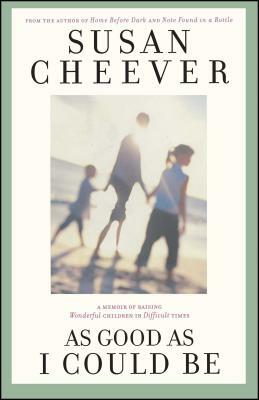 With unflinching honesty, Cheever tackles tantrums, divorce, eating disorders, and alcoholism, celebrating how she and her kids have weathered all this -- and more -- with love and respect intact. Philadelphia Inquirer It is Cheever's ability to dive suddenly from the surface to the deeper places of the soul. Los Angles Herald Examiner Out of the pain of real life, Susan Cheever has created a document that is ultimately a paean to family love. The New York Times Book Review Cheever's writing has true resonance.